Young players who represent the future of tennis are ushering in a new era as they inaugurate the new VandePoel-Heeringa Stadium Courts at Hope College this month. Just hours after the last striping dried on Monday, June 4, the courts, which are part of the Hope College Tennis Complex at the Ekdal J. Buys athletic fields, began hosting the local qualifier camp for high-school-level, district United States Tennis Association (USTA) competition. The courts’ main workout will begin on Monday, June 11, with the start of the annual summer Hope College Tennis Academy, which across its nine-week run will be attended by some 450 players spanning kindergarten through 12th grade. The activity reflects that the 12-court facility has been developed as a resource not only for the college but for the community. In addition to providing a new home for the college’s intercollegiate tennis program, and hosting programs like the Tennis Academy and the USTA qualifier camps, it will also be available between such activities to those simply looking for a place to play a game themselves. The $2.159 million facility, which includes elevated seating for spectators and an officials’ shelter, is named for Earle Vande Poel ’35 and George Heeringa ’36, doubles partners on the Hope tennis team in the 1930s. Funding was from private donors, including leadership gifts from the Etheridge, Heeringa and Vande Poel families as well as a grant from the USTA. The USTA grant reflects an extensive review process during which the college worked with the association to assure that the facility meets the organization’s quality standards, including QuickStart lines scaled to the ability and size of young players. 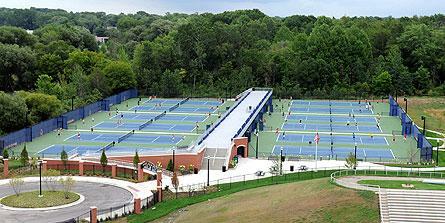 Hope’s tennis facilities also include the six-court, 40,000-square-foot DeWitt Tennis Center, which opened in 1994. The indoor center, named in honor of the Gary and Joyce DeWitt family, has itself earned national recognition, named the “Public Facility of the Year” in 2010 by the Professional Tennis Registry (PTR). “At the Division III level, we definitely have the top facilities in the country,” said Jorge Capestany, who manages both the indoor and outdoor courts. In fact, he noted, the new outdoor courts are a crown jewel that shines at any level. “That facility in and of itself, many people would think is the nicest facility in Michigan right now,” said Capestany, who is one of only 10 people world-wide who is a master professional with both the United States Professional Tennis Association and the PTR, and has received multiple regional and national awards for excellence. Capestany values that Hope plays a role in encouraging and developing young players. He noted that the college’s tennis academy is the state’s largest. Those attending, grouped by ability, range from five-year-olds learning the basics on the specially designed “QuickStart” courts to some of the area’s top-ranked high school and college athletes. The impact on Hope students will be no less significant, with the new facility meeting an immediate need for home-court space. Competitive tennis has a long history at the college. The first men’s tennis match with an outside opponent occurred in 1916, against the Grand Rapids YMCA. Tennis is Hope’s longest-running intercollegiate sport for women, played in a co-ed format when in 1921 Hope men and women participated in a six-team tournament in Kalamazoo. For more than half a century, the college’s teams played their home matches on the courts located on Columbia Avenue at 13th Street, but in recent years the deteriorated condition of the courts rendered them ineligible for intercollegiate play. In the interim, Hope’s home matches have been held at local high schools. The Columbia-Avenue courts were city-owned, but acquired by the college in 2011. Four remain for casual play, while Hope has developed portions of the site for other uses including a beach-volleyball court for students. In the first half of the 20th century, the college had its own courts in two on-campus locations: southeast of Lubbers Hall, located near 10th Street between College and Columbia Avenues; and where Dimnent Memorial Chapel, built in the 1920s, now stands. Construction on the VandePoel-Heeringa Stadium Courts, part of the college’s “A Greater Hope” comprehensive campaign, began in the fall of 2011. A dedication is being planned for Saturday, Sept. 22. The VandePoel-Heeringa Stadium Courts are located east of Holland Municipal Stadium near Lincoln Avenue and 13th Street. Hope College continues to hold more grants for summer collaborative faculty-student research from the National Science Foundation (NSF) than any other undergraduate college in the country. The Hope College Knickerbocker Theatre’s free showing of “Willy Wonka & The Chocolate Factory” has been moved from Thursday, June 21, to Thursday, Aug. 16, due to a scheduling conflict at the theatre.